I felt a bit emotional yesterday. My 11 month old is growing up in leaps and bounds and I can’t help but feel happy and sad at the same time. She’s been giving us loads of problems lately – first it was off her milk completely, then off her food, then waking constantly in the night. However, in the last week or two (fingers crossed) things have improved. I’ve made a huge effort to give her more finger food as she prefers feeding herself to being fed, she’s drinking milk and water from a cup herself and she’s sleeping better. She’s always gone to bed from 7 until 7 but she’s woken up almost hourly for weeks and I was beginning to wonder how I’d cope. However, in the last 2 weeks she’s started crawling and now pulling herself up and standing and it seems that this exercise is tiring her out so she is sleeping better. I’m still up with her a couple of times but not every hour. Yesterday I thought it was time she had her first pair of shoes. Her brother went through a couple of pairs of soft shoes but she’s always seemed to prefer barefoot. I fell in love with a pair of little purple shoes from Clarks, which make her look so grown up. 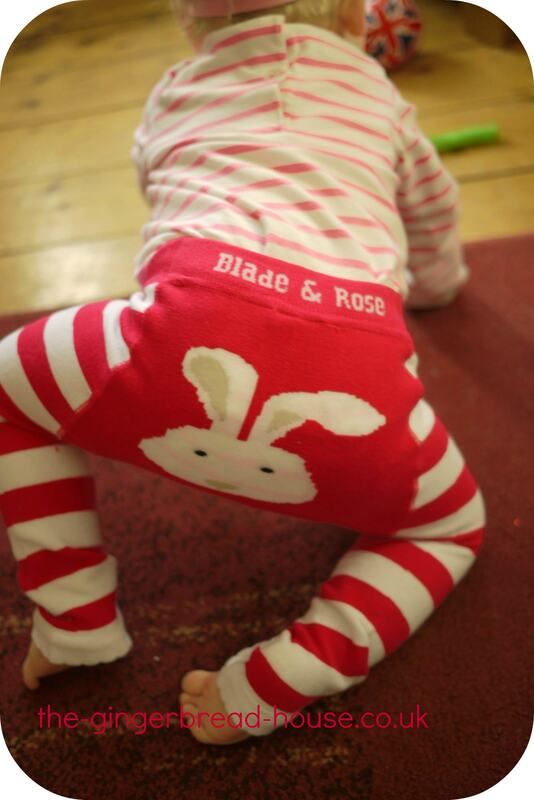 She was sent a pair of very cute baby leggings from Blade and Rose which feature a range of tasteful designs on their bums from dinosaurs to rabbits. They were designed by a mum who was frustrated at always seeing her daughters bum on show ! I think you can tell when a product has been designed by someone who knows what is needed. Little Sis needed some protection on her poor old knees too and these are fab. The material is soft but stretchy and fit very well. She’s wearing the size 1-2 years because she’s tall but there’s plenty of length so I know she’ll get good use from them. This will be the only time in her life (I hope) that I will be taking a photograph of her bottom! Those are very sweet. I love the big bunny.